This paper reviews some of the extant research on unconscious (or implicit) bias, a term that refers to cognitive errors in the way humans process information about themselves and others　based on stereotypic assumptions about social groups. Unconscious bias arises from the mere　existence of group stereotypes and can lead to errors in judgment and decision-making that　may unwittingly and unintentionally conflict with one's explicit and consciously held beliefs. We discuss how cultural stereotypes about men and women give rise to unconscious gender　bias and how this bias systematically constrains opportunities for women's career advancement　in organizations, particularly in taking up top leadership positions and in fields historically　dominated by men such as the sciences, technology, engineering, mathematics, and medicine　(STEMM). 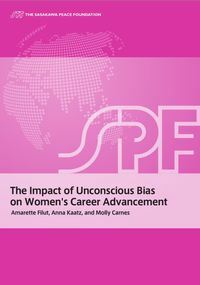 We conclude with a review of interventions that appear to be successful in mitigating　the negative impact of unconscious gender bias on women in hiring and performance rewards.The discussion includes the description of one controlled study that approached unconscious　gender bias as a remediable habit and was successful in helping faculty at one large university　break the bias habit with improvements in department climate for all faculty.